South Fulton County resident, Tim McCullum experienced a wave of emotions after he received a phone call from Fulton County police on Feb. 9. But it was more than that just a bomb threat. The caller told the 911 operator he was not alone. “He said he had two family members in the house with him and that he was going to kill them,” Fulton County police SWAT Captain Wade Yates said. When that call came in, Yates and his SWAT team responded quickly. “What scared me the most that night is that all my guys are running in emergency mode. They are running the blue lights and sirens, cutting through traffic to get to this call,” Yates said. McCullum lives on Topaz Road in Riverdale, where Fulton County fire fighters, patrol officers and the SWAT team all responded to. They shut down Old National and evacuated several homes in McCullum’s neighborhood for four hours. “We started doing a background investigation to determine who it might be, what their motivation might be and that’s when we discovered the homeowner lived there alone, no one should be in the house and realized it was a ‘SWAT-ing’ incident,” Yates said. “It was probably like 50 to 60 cops out here. If something was really going on somewhere else, we’re losing out of potential resources because these people are here on a bogus call. If anyone gets caught they definitely need to be prosecuted,” McCullum said. Charlotte is in the Finger Lakes area of New York, which means that this is the second time in the last four months an elderly person in that region has been a victim of a wrong-door raid. In March, police working under the Finger Lakes Drug Task Force raided the home of 76-year-old Fred Skinner. The image above is copied from the video supplied for the Fulton County SWAT. I didn’t want to link the video because it is so goofy. Notice what they have done to the M-4 style AR. They have attached an ammunition box to it, and in the video they are shown carrying drums (like a SAW operator, SAW being Squad Automatic Weapon). My own son operated a SAW in the 2/6 Marines, with a combat tour in Fallujah in 2007. He also trained the 2/6 Marines. Golf Company, SAW operators. Fully automatic weapons like that, needing ammunition drums, are area suppression weapons, and even then, using an open bolt system (unlike the closed bolt design of the weapon in the photograph), it has to be operated judiciously to keep from melting the barrel. There is no … reason … whatsoever … that a reaction team of any sort (in law enforcement in U.S. cities) needs area suppression fire. None. This is yet another indication of just how out of control this militarization of police tactics has become. The young man who chambered a round in his weapon is very fortunate that he didn’t die. One never knows, of course, since dressing up in tactical gear and announcing as law enforcement officers has become a tactic for criminals to use in home invasions. 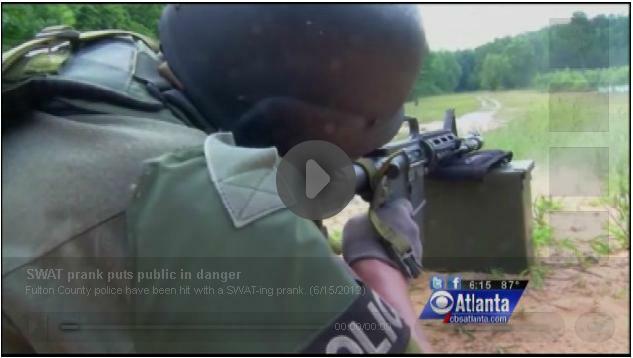 He took his chances that the SWAT team wasn’t a gang of criminals, and this time he was right. In the future, will the SWAT team be so restrained? Will the young man guess right and stand down? These are salient questions as we ponder the fate of poor Mr. Eurie Stamps, who perished when an incompetent SWAT officer stumbled across his prone body and fired his weapon because of sympathetic muscle reflexes (the officer had no trigger discipline and shot Mr. Stamps who was lying on the floor). Muzzle flagging innocent people would get most ordinary citizens prison time. And it should. But the courts do not see law enforcement officers as ordinary citizens. They should. The weapon used by LEOs carries no more authority than does the one I carry on my own side. The Supreme Court decision in Tennessee versus Garner allows LEOs to fire their weapon in self defense, and not to prosecute detentions or arrests. In other words, they cannot shoot someone who refuses to be arrested. These military tactics, dangerous because poor training, poor muzzle discipline and poor trigger discipline have caused and will continue to cause needless deaths and injuries, will stop when the public outcry is loud enough. The courts could also stop it, but their self-proclaimed protections of citizens has proven to ring hollow. There is an easier way. Police departments could stop the tactics voluntarily. As my son has observed, if someone wants to be an “operator,” they should join up, take the training, fly across the pond, and do it for real. Otherwise, they are peace officers. Departments can dispatch uniformed officers to disturbances to ascertain the need for any further escalation of force. Then, in the words of my co-writer, Glen Tschirgi, himself an attorney, the solution is simple. In plain speak, it means, essentially, that if you choose to operate, for instance, an explosives factory, you are going to be held strictly liable for any and every screw up or harm done that results from your activities. No ifs, ands or buts. No defense. A more common example is the one in Maryland where the courts recently imposed strict liability on owners of pit bulls. If you choose to own one, you are liable for *anything* that dog does. It is basically a four-legged, panting, drooling lawsuit walking around. Whatever the catalyst, changes must be made. They’re using an ammo can as a firing rest in that picture; it’s not attached to the weapon. There are no AR’s in that video with drums on them that I saw, nor are there any readily available AR platform weapons that use SAW drums. You’re right that a SAW would be totally out of line for virtually any LEO use – there is nothing an cop (SWAT or otherwise) might conceivably use it for that a regular AR-15 would not do better. Watch the rest of the video. One officer is carry drums. You are currently reading "Continuing SWAT Raid Errors And Pranks", entry #8660 on The Captain's Journal. This article is filed under the category(s) Police,SWAT Raids and was published June 21st, 2012 by Herschel Smith.